I potted up this amaryllis a few days after Christmas and voilà, in about six weeks it’s grown and produced three lovely flowers (should be four). It never ceases to amaze me that such a big plant grows so quickly from a knobbly brown lump. Your amaryllis is beautiful. It certainly brightens up this gloomy day (raining here, too). What a pain having Internet problems, I hope it's fixed sooner rather than later. Things always seem to happen on a weekend! Thank you; it really does cheer me up. The hub is working again but goodness knows when I'll get my phone back. It’s beautiful. I love the explosion of colour from such a dry dusty bulb but yours is spectacular. Thank you! There's another stem with four flower buds, so more to look forward to. The phone/broadband problems were finally (I hope), sorted yesterday evening. Phew! Beautiful weather for my birthday, too! There are even daffodil buds and a crocus in what passes for the lawn. Things are looking up. I'm glad you had flowers to enjoy on your birthday and that the broadband is fixed! 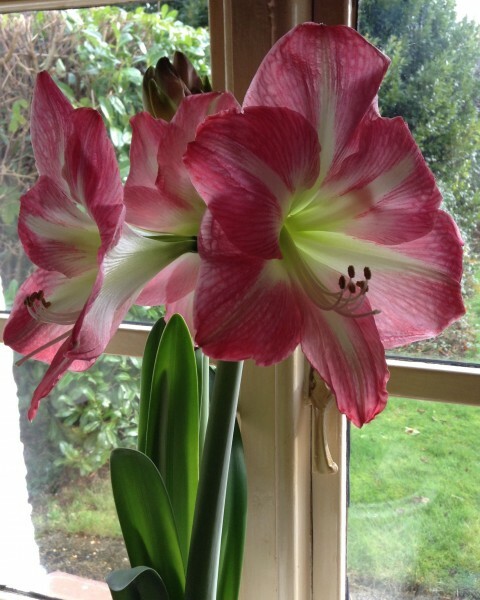 What a beautiful amaryllis- one of my favorites. Amazing, aren't they? The second stem had the correct four flowers! I was really pleased.